NYSCHP’s Downstate Student Program provided students with the tools needed to pursue a PGY-1 residency and allowed students to network, learn, and grow. The program’s highlights included: Interviewing skills, CV and letter of intent writing, presentation skills, and navigating at ASHP’s midyear clinical meeting. Mary Choy, PharmD, CGP, educated the students on proper interviewing techniques. The students gained great tips on practicing good interview etiquette (before, during and after the interview). 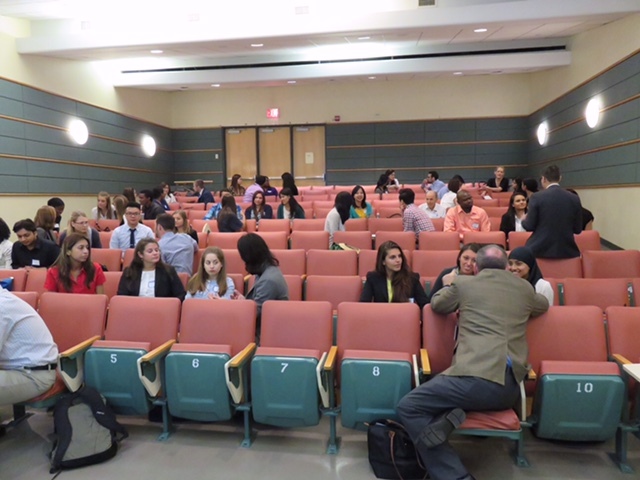 Additionally, students learned about managing different styles of interviews and were given the opportunity to practice questions with current residents, faculty and program directors. Students formed smaller groups, allowing them to learn not only from their mentor, but also from each other. By answering common interview questions in such a setting, students learned about their strengths and were given constructive feedback on areas where they can improve. Regardless of who the interviewer is, it is essential to remember to relax, focus and articulate. Similarly to the interviewing skills workshop, students formed into smaller groups and received one-on-one detailed feedback on their CV and letter of intent. Adam Pennoyer, PharmD, PGY-2 at NewYork-Presbyterian Hospital, guided the students in utilizing their time and resources efficiently in order to gain maximum advantage at the Midyear Clinical Meeting. The students received tools to get a jump-start on planning the trip to New Orleans, LA, during the first week of December. Some of his tips included: start researching programs now, organize meetings and interviews accordingly, network, & most importantly – look and perform your best! Sara Hammad, PharmD, PGY-2 at New York-Presbyterian Hospital, provided us with the advantages of completing a pharmacy residency. Students gained insight on the purpose of a pharmacy residency, the application process and the “match” process. There are over 800 pharmacy residency programs across the United States and the opportunities are endless. & be aware of your time frame. When students are asked to present, they are informing the audience of the topic while incorporating their personality and professionalism in the presentation. Lastly, PGY-1 and PGY-2 residents from The Brooklyn Hospital Center, Kingsbrook Jewish Medical Center, Montefiore Medical Center, and New York-Presbyterian Hospital gathered to answer any questions the students had and share additional advise. Learning about the residents’ enthusiasm, ambition and drive truly inspired the students to continue working hard and pursue a path towards pharmacy residency.